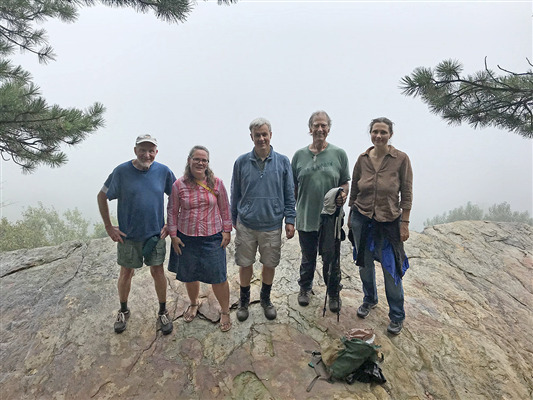 Nine Friends from Goose Creek, Hopewell Centre, Frederick and Shepherdstown Meetings joined Sheila Bach at the Niles Cabin for a lovely picnic, fellowship and for the stalwarts shown below, a hike to Raven Rocks. While the weather was not optimal, all were in high spirits and smiles were in abundance even after puffing up to Raven Rocks (see below). Tom and five other local poetry lovers met in the Niles Cabin to share poetry, ideas, and images and a wonderful lunch cooked by our own Sheila Bach. Tom provided an added highlight to his original poems (which drew from a trip to Israel in 2018 and his time doing actual line work for Verizon in Brooklyn, NY) by showing slides from both trips and providing commentary which added rich context to his poetry. We hope you will join us at the cabin for future poetry events such as the one to be facilitated by Hayden Mathews on Saturday, February 9th, 2019. Nine poetry lovers with several published poets in their midst, gathered at the Niles Cabin for a wonderful day of sharing words, thoughts and impressions. The words shared ranged from Mary Oliver and Robert Frost to translations of Gilgamesh, thoughts on words from an African scholar, and lyrics from country songs - a truly eclectic and wonderful blend. With the always remarkable cooking from Sheila Bach to power our way into the afternoon, we departed the FWC at the program's end richer, fuller, and wiser for the experience. All present indicated they would likely be back for the next poetry circle in November.